The Handy Labels team want every single one of our customers to be delighted with their order not just satisfied. We take great pride in the work we do at Handy HQ, we’re so confident that you’ll love your labels, we promise to reprint your order or offer you a full refund if we don’t stick by our high standards. Our belief is, you can run a company one of two ways; the easy way is the easiest (obviously) but it ends up with a high turnover of customers and often becomes more difficult because those customers are rarely content with the service. 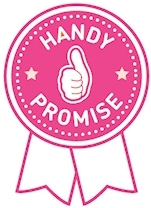 At Handy Labels we prefer to do things the hard way, attention to detail, fastidious quality control and going the extra mile all take time and effort but it means you don’t have to spend time dealing with disgruntled customers and a high client retention rate means less resources need to go on sales. A win-win for everyone. Who do I contact if I have a query about my order? If for some reason you receive your handy order and it’s not as expected then please get in touch as soon as you can, either call us on 01275 460 516, send us an email or use our live chat and let us know the problem. How quickly can my query be answered? Our friendly customer service team are available from Mon-Fri from 9.30am - 5.30pm, we’ll respond to all emails within one working day. What happens if the problem can’t be resolved? It’s very rare that we’re unable to solve the problem, it may be a case of simply reprinting your order again or supplying you with a coupon for you to place a new order with us. What happens if I’ve made a typo or I’ve used incorrect artwork? We’ll amend your artwork for you or ask you to supply an amended design if your artworks un-editable, we then offer you a discount coupon for you to submit a replacement order, one that’s correct and you’re happy with. At Handy Labels, we think we are quite good at what we do, but we thought it would be better if we let some of our previous customers tell you about us instead. I can highly recommend Handy Labels having recently made our first purchase with them. The ordering process was very simple. the staff were friendly, efficient and helpful. I couldn’t be happier with the labels and stickers received. The quality was excellent, colours matched perfectly to our artwork, and delivery was prompt. Sarah, Skin & Tonic London. Handy Labels are easy to work with and v. efficient. They have followed our requirements and gone above and beyond to get labels to us fast when we’re up against deadlines. They are happy to do small print runs which is great for a small, start up business like ourselves. We’ve been very pleased with the quality, colour and print of the labels. We are always impressed with the quality of labels that you provide. Just wanted to write and let you know how pleased we are with the chocolate bag labels that you have printed for us. In fact we are always impressed with the quality of labels that you provide and the quick service you offer. Sometimes it is nice just to say thank you for a job well done! Please pass my thanks on to all concerned. Labels received this morning. We are thrilled to bits with them , thank you very much indeed. When these are finished we will be back for more! Courier gave me a two hour delivery slot which was great and the labels were packed beautifully. I will definitely be using you guys again. Just wanted to say thanks for the help with my design and such a speedy service and brilliant quality stickers! Please pass this on to your team, especially Jackie who took my original call and was really helpful. Fantastic service we will definitely use you again. Labels arrived this morning and they are exactly what we wanted. Fantastic service we will definitely use you again. Price, service and product were all excellent. I assume you are extremely busy and successful. You deserve to be! Please pass this on to Jackie too.